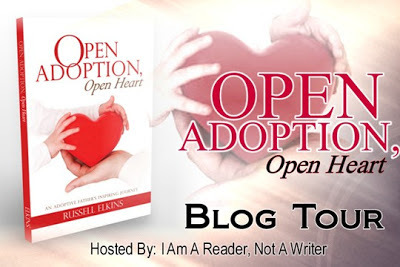 Laurie Here - Contemporary Fiction and MORE - Book Reviews: Open Adoption, Open Heart by Russell Elkins "Excerpt and Spotlight!" $25 Amazon Gift Card to enter to win, too! Open Adoption, Open Heart by Russell Elkins "Excerpt and Spotlight!" $25 Amazon Gift Card to enter to win, too! Since our situation seemed to be drastically different every week, our friends were always ready for an update. I actually wondered if some people suspected me of making some things up. Our life wasn’t usually so dramatic. One minute Brianna wanted us as parents, and then she couldn’t have us. Next thing Melissa wanted us to raise her child, and then they both wanted us, then just Brianna. If I hadn’t already gone bald, I’m sure my hair would have fallen out. Even though Jammie (my wife) and I had lost hope because of the legal issues, Brianna (biological mom) still had hopes about the adoption. She still had hopes we could figure something out. While Jammie and I were meeting with our caseworker again one day, I randomly asked him about a thought I had. One of my best friends from college adopted a baby a couple of years earlier, and he chose to adopt the baby through the state of Utah even though neither he nor the birth mother lived there. I was not sure about all the details, but they chose to do it that way because the laws of Utah were much friendlier toward adoption than the laws of California where they lived. So, thinking a little bit about that situation, I asked if there was anything we could do about having Brianna go through our state of Idaho instead of her home state of Mississippi. It seemed like a long shot. In fact, I didn’t really think it was a shot at all, just a thought and a wonder, but it ended up being an option after all. We asked Brianna if she would be interested in doing the adoption through our state. The only way to make it happen, though, was for the baby to be born here. The only way for that to happen was for Brianna to come to Idaho. Russell Elkins was born on Andrews Air Force Base near Washington, D.C., in the fall of 1977. Along with his five siblings, he and his military family moved around a lot, living in eight different houses by the time he left for college at age 17. Although his family moved away from Fallon, Nevada, just a few months after he moved out, he still considers that little oasis in the desert to be his childhood hometown. He and his family now live in the Boise, Idaho area. ***To ENTER the $25 Amazon Gift Card Giveaway, PLEASE CLICK HERE!!! You will find the Rafflecopter form to ENTER it! Good Luck!